The middle years student is at the center, developing into an internationally-minded person through the IB Learner Profile. Global concepts, approaches to teaching and learning, and areas of interaction provide connectivity and transference between subjects. Service to one's commmunity and completion of a culminating Personal Project apply student learning to authentic, real-world challenges. Eight MYP subjects are required to provide rigorous, well-rounded knowledge, skills, assessments, and attitudes tailored for the 21st century. International-mindedness is the encompassing framework for learning. progress/proficiency on the MYP assessment criteria, using IB rubrics for "criterion-referenced grading"
The state content standards ~ the required curriculum for each subject as defined by the Colorado Department of Education ~ are translated by teachers into "evidence outcomes" that clearly express what the student should know, understand, or be able to do in order to meet the state standard proficiently. As students practice through "learning activities" like classwork and homework, teachers provide formative feedback that lets students know at which level they are currently achieving and what they can do to improve to the next level. When a unit concludes, then, and students have had time and feedback to guide their learning, teachers provide a summative task for students to demonstrate their best achievement on the targeted evidence outcomes. The grade a student earns for this summative task is called a "unit performance." The summative assessment tasks, and many formative tasks as well, are linked by teachers to one or more specific MYP assessment criteria that are part of that MYP subject and reflect the MYP aims and objectives. Teachers choose the best MYP rubric(s) that will accurately measure the level of efficacy, depth and creative independence their students can show in their evidence outcomes. The MYP rubrics are the measuring tools of student achievement; they explain HOW proficient students are on their content standards, and how they can improve to the next level. The MYP rubrics and the state standards work hand-in-hand to set a clear, explicit target for students, allow multiple chances to practice what's necessary to meet or surpass that target, provide relevant constructive feedback for improvement, and determine a level of achievement along a continuum that desribes what success looks like at each level, from novice up to mastery. 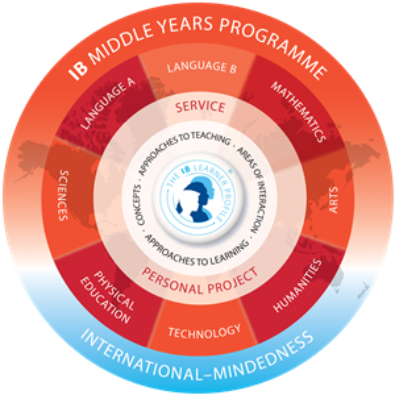 As is presented in the visual model of the IB Middle Years Program, there are eight subjects that are all required for a minimum of 50 instructional hours in each year of the MYP. For each subject, the MYP assessment criteria is used as the "measuring tool" for teachers to determine how well students can demonstrate the Colorado state content standards. To simplify our assessment practice, the state content standards are WHAT we measure for student achievement, and the MYP assessment criteria are HOW we measure for student achievement. We utilize our gradebooks so we can report out on either axis, the student progress toward/beyond proficiency in the state standards, or the student progress toward achievement and independence in each assessment criterion. To visit the Colorado Department of Education home page for content areas and standards, please go to http://www.cde.state.co.us/contentareas/index.asp. You can read over our district and MYP assessment policy in the link below. The MYP Arts span both the visual arts and the performing arts. The MYP requires students to compile over time a portfolio called the "Development Workbook." The Development Workbook (DW) allows students to reflect on their artistic process, consider teacher feedback in meaningful ways, and connect their skills to how and why they learn. In Summit schools, our Arts teachers provide instruction in the Colorado state content standards for Music and Visual Art. At this time, our Arts programs do not include the Colorado state content standards for Dance, or Drama & Theater Arts. There is sometimes confusion in MYP schools over the nature of the "Technology" subject area. A distinction must be made between the MYP Technology subject, which is more aptly described as "Design Cycle," and the Information and Communication Technology (ICT), which often includes the use of computers, presentation and database software by students to perform and communicate their work. Inquiry and problem solving are at the heart of MYP technologyMYP technology requires the use of the design cycle for solving problems in technology and promotes a practical and inquiry-based approach. The subject uses the design cycle as the model of thinking and the strategy to help students investigate problems and design, plan, create and evaluate the products/solutions that they generate. A product/solution can be defined as a model, prototype, product or system that students have generated independently. This means that MYP technology expects students to become actively involved in and to focus on the whole design process rather than on the final products/solutions. This helps students to develop not only practical skills but also creative- and critical-thinking strategies. Information and communication technology (ICT) involves the use of computers, its applications and communications facilities in teaching and learning activities. The use of ICT extends to all the teaching and learning in all subjects across the curriculum. The effective use of ICT is as an ‘Approaches to Learning' (ATL) skill that permeates all other subject areas. Our district's Technology teachers are responsible for covering the National Education Technology Standards (NETS), which were written by the International Society for Technology in Education (ISTE). The NETS meet or exceed the Colorado state content standards for ICT, which now are found embedded into the other Colorado state content areas. Therefore, to meet our minimum of 50 hours of instruction and assessment for MYP Design, Summit Middle School is implementing a plan to integrate the MYP Technology objectives and criteria into other subjects. This is a work in progress as of April 2013 so stay tuned for more! Humanities courses teach what is traditionally known as Social Studies. Humanities teachers are responsible for covering the Colorado state content standards for Social Studies. Language "A" refers to the primary language of instruction in an MYP school. For our schools, that is English, so Language A is synonymous with language arts class. Language A teachers are responsible for the Colorado state content standards for Reading, Writing and Communicating. Language B refers to the acquisition of an additional language after one's mother tongue. MYP Language B is designed to expose students to five full years of continuous instruction in the same world language, in order to facilitate the communication abilities holistic learning, and intercultural awareness that are the cornerstone of international education. Students are supported in acquiring functional fluency in their Language B by the end of year 5. Currently, Summit schools offer Spanish and French as their Language B choices. Language B teachers are responsible for covering the Colorado state content standards for World Languages, which are written for novice through intermediate levels. Language B teachers work to modify all four of these criteria in the classroom to accommodate different phases of language acquisition and to correlate the criteria with the level of state standards (novice to intermediate) a student is working on. Our Math teachers are responsible for covering the Colorado state content standards for Mathematics. They provide a strong continuum of mathematics courses that meet students at their appropriate developmental level and build solid foundations for advancing concepts as students progress. Our Physical Education, or PE, teachers are responsible for covering the Colorado state content standards for Comprehensive Health and Physical Education. Our Science teachers are responsible for covering the Colorado state content standards for Science. communication—representing the notion that schools should encourage open and effective communication, important skills that contribute to international understanding as exemplified by the attributes of the IB learner profile. The Use of Guiding Questions prompts students to consider the big conceptual ideas, or "enduring understandings" of their subject and shows them how their lessons are relevant pieces of a bigger picture. Effective Guiding Questions are generative, meaning they generate multiple avenues of inquiry and investigation. They suggest various connections among subjects and invite students to think deeply through a global context or Area of Interaction. Active questioning keeps the brain engaged: an inquiring mind is absorbing information and constructing meaning. Deliberate and thoughtful questioning instigates higher order thinking skills (H.O.T.S. ), depth of knowledge (D.O.K. ), and authentic and practical applications, and transference of learning....all crucial ingredients for the 21st century, according to both educational and business researchers. The IBMYP builds on the significance of INQUIRY in the Primary Years Program to continue to push student thinking forward and outward. The principles of the MYP are deeply rooted in international education. They are shared by all the IB programmes, are stated within the IB’s mission statement and provide a framework for constructing a school’s own curriculum. The driving force behind all IB programmes is a deeply held philosophy about the nature of international education. This philosophy is reflected firstly in the IB mission statement, which expresses the IB’s overall purpose as an organization promoting and developing programmes of international education. Secondly, the IB has made a statement of its beliefs and values as defined by the outcomes of student learning in IB World Schools. The IB defines this learning through a learner profile that encompasses the aims of the curriculum. The MYP Personal Project is an important aspect of the MYP, undertaken by students over an extended period of time and a major component of our 9th and 10th graders' experience. As a culminating experience, much like the Primary Years Program (PYP)'s Exhibition and the Diploma Program (DP)'s Extended Essay, it is the product of the student’s own initiative and creativity, reflecting a personal appreciation of the MYP's areas of interaction and the application of approaches to learning skills. The Personal Project should be seen as a self-designed activity through which students present, in a truly personal way, their understanding of real-world themes, concepts and issues using the areas of interaction as a lens for interpretation and analysis. Students’ practice of approaches to learning skills over the earlier MYP years should prepare them gradually for working independently and developing a project over an extended period of time. Students have an opportunity to choose a project that allows them to explore a topic of interest to them, and to present it in a way that reflects their learning style. Summit High School offers students flexibility to facilitate personal expression, for example through the use of a student’s mother tongue or access to technology, and the support through REACH classes to help students plan out and complete this type of high-level endeavor. Students often surprise themselves when they realize what they are able to achieve. Once Personal Projects are completed during the students' 10th grade year, an event is held in which students display and present their projects to the community, sharing their reflections and victories and what they learned. Students who are successful with their personal projects are well prepared to tackle the multiple challenges and opportunities that come in 11th and 12th grade and beyond high school. It is important for our Middle Years Program that all staff, parents and students understand the central importance of the Personal Project. Detailed guidance on the Personal Project's aims, objectives, organization and assessment is provided in the MYP Personal Project Subject Guide. Service and Action in the Community CHANGES COMING SOON! Students learn to choose to act, and to reflect on their actions, so that they contribute to their own well-being and that of the community and their environment. Every Summit Middle School student is exposed to a minimum of two hours of service and reflection within the academic curriculum, known as "service learning." Beyond this, our students are highly encouraged to take the initiative and expand their number of hours with additional projects. After each grading term, a student's documented hours turned in so far for the school year are shown on the quarterly report card. How is the Summit-Lake Dillon Optimist Club involved? The Summit-Lake Dillon Optimist Club partners with Summit Middle School to recognize one student per team per quarter at an awards luncheon. Students are chosen by teachers on the basis of their character and intrinsic kindness and helpfulness to others. Student winners are awarded a special certificate and interviewed for Summit County Television. Thanks to the Optimists, these luncheons are a wonderful way to celebrate some of the caring, principled young people who are contributing to our community and "making the world a better place." Where are details about possible projects? Details about service projects around the county can be found at the entrance to each Learning Community, both upstairs and downstairs, on the community service bulletin boards. Students are encouraged to take the available memos so they can initiate contact themselves. Reflection sheets are also available on the bulletin boards (see below). Current postings include the Summit County Animal Shelter, the Summit Thrift & Treasure Store (which benefits the Family and Intercultural Resource Center), the Frisco Historic Park, Summit County's Public Libraries, Domus Pacis, and the Farview Horse Shelter. This list is not exclusive, though - students may earn community service credit by volunteering at any church function, through 4-H or scouts, helping out at elementary school events, assisting a teacher, recycling, etc. As long as the three guidelines below are followed, students may be as creative as they'd like. 1. The service involves time and personal energy as opposed to money. 2. The service benefits organizations, areas or individuals with a legitimate, not-for-profit need. 3. The service has an impact outside one's family and household. Students have until two weeks before the end of a quarter to complete hours and turn in the reflection paperwork. Where can we find the reflection forms? Forms are located at SMS on the community service bulletin boards and in front of the Main Office. You can also access it by clicking here: SERVICE AS ACTION Reflection FORM Students must complete this and turn it in to the MYP coordinator to earn credit for service hours. It is not graded but should demonstrate thoughtfulness. A parent or the project supervisor needs to sign the bottom of the form for accountability.